This advanced cutting system derives its efficiency and power by pressurizing water at up to 55,000 psi... and focusing it through a jewel as small as .003" in diameter. Traveling at speeds up to 3 times the speed of sound, the jetstream cuts without heat and exerts little vertical or lateral force. 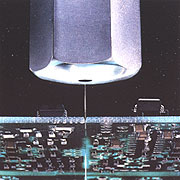 Abrasives can be introduced via the Paser System... Particle Stream Erosion. This abrasive jet cuts by impacting and eroding the workpiece, rather than sawing, severing, shearing, burning or grinding, thereby eliminating material degradation. The waterjet cuts relatively soft material with ease. With the Paser, it cuts the hardest alloys and composits faster and cleaner than lasers and conventional methods. Close loop DC servo motors drive the fully programmable, 3-axis gantry with submicron positioning accuracy. These motors provide flexible, quick-response positioning, accuracy to within .001" for shape or contour cutting-depending on material type and thickness. 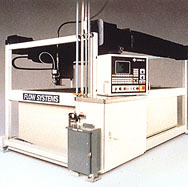 The water knife path is controlled by computer and with its 3-axis capability, it can cut complex shapes and contours effortlessly. The small kerf, speed and precision of our cutting system makes it ideal for cutting sensitive materials. Equally important, the low cutting temperature and the fact that there are no clamps, drills or other tool contact with the material assures there will be no substrate damage.